As we start the last quarter of 2016, we take a look back at changes in our places data from this summer. 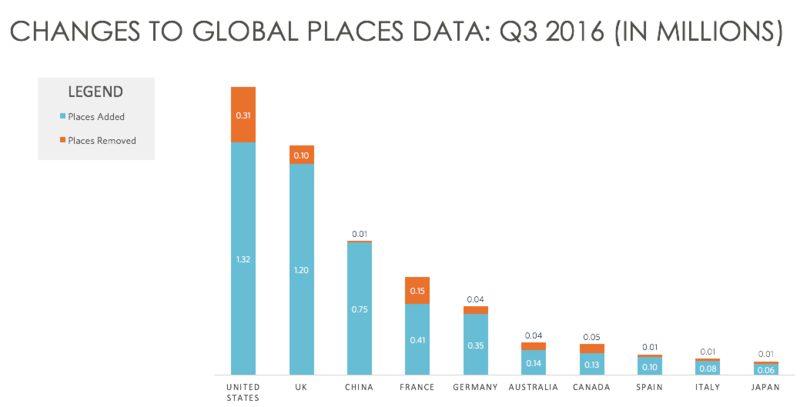 The following report shows how many places were added or removed in Q3 from our Global Places data. Factual’s Global Places currently covers over 100MM local business listings and other points of interest in 50 countries around the world. Places change all the time new places open, old places close, places move, and some places change their names or other details, so we’re constantly working to make sure our data best reflects the real world. This report gives a snapshot of changes for the following countries: Australia, Canada, China, France, Germany, Italy, Japan, Spain, United Kingdom, and the United States. In Q3 2016, we’ve added 4.5MM new businesses or places and removed 760K places no longer in operation.